* Please be aware that any derogatory remarks made during these history pages about Tottenham Hotspur are purely intentional and are meant to offend any supporters of the said club as much as is legally possible. The author would also like to take this opportunity to thank all Tottenham supporters worldwide for giving us their First Division place in 1919, he would also like to gloat at never giving it back! Oh, thanks for Pat Jennings as well!! In approximately October 1886, the arrival of two Nottingham Forest players Fred Beardsley and Morris Bates was the catalyst that David Danskin from Kirkcaldy in Fife needed to create a works football team at the Woolwich Arsenal. Fifteen players were recruited, and all contributed towards the purchase of their first football. As one of the workshops within the Arsenal was called Dial Square, the name was chosen to represent the team. The first game of the new club was against a team called Eastern Wanderers on the 11th December 1886. the game was played on a piece of open ground that someone had found on the Isle of Dogs. Apparently the pitch (if it could be called that) was shapeless with one portion being described as a ditch by some and as an open sewer by others.. Still, history says that Dial Square won the game 6-0. This result filled the players with enthusiasm and resulted in a meeting at the Royal Oak, next to Woolwich Arsenal Station, on Christmas day 1886. The meeting was called to solve three major problems. These problems were, a shortage of name, kit and somewhere to play. Apparently, no-one was happy with the name Dial Square, and a combination of Royal Oak and Woolwich Arsenal resulted in the regal sounding name Royal Arsenal which was met by approval from all. The decision for choice of kit was almost as easy, Fred Beardsley wrote to Nottingham Forest asking for help. Forest generously sent Beardsley a complete set of red shirts and a ball. Plumstead Common recreation area as home venue was the third decision arrived at on that fateful Christmas day. 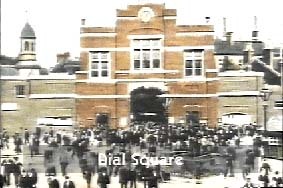 The first official fixture that Royal Arsenal played at Plumstead Common was against Erith. The final result was a 6-1 home victory. Manor Field is affectionately re-named Manor Ground for purposes of grandness! Royal Arsenal won the Kent Senior Cup, the Kent Junior Cup, and more significantly, the London Charity Cup. The latter was concluded with a 3-1 win over Old Westminsters at the Manor Ground in front of 10,000 people. 1893 Greedy Landlord tries to cash in on new success!! A home crowd of 12,000 people against Scottish Champions Hearts combined with Woolwich Arsenal's election to the Football League (when the size was increased from 12 to 15 teams) resulted in a rent increase from £200 to £350 per annum. Woolwich Arsenal could not afford this exorbitant request, and were left with no alternative but to repurchase the old Manor Ground. They formed a limited liability company with a nominal capital of 4,000 £1.00 shares. In all, 860 people subscribed for 1,552 shares, the largest shareholder (50 shares) was a local coffee house proprietor . With the help of supporters, the team worked throughout the summer to get the ground ready for the Second Division. The arrival of Harry Bradshaw as manager in 1901 resulted in a 4th position, followed by 3rd, and 2nd in 1904 gaining Woolwich Arsenal promotion to the Football League First Division. 1914 Name changed from "Woolwich Arsenal" to "Arsenal"
In 1919 the Football League decided to extend the First Division from 20 to 22 clubs. The usual procedure had been to simply re-elect the bottom clubs from the previous season and to promote the top clubs from the Second Division. This indeed was what almost everyone assumed (and were told) would happen. By chance, two other London clubs, Chelsea and Tottenham had finished 19th and 20th in the First Division in 1915, with Arsenal finishing 5th in the Second. When the League AGM was convened, Norris' strategy became clear. It must have been agreed with League President John McKenna, a close friend of Norris and the owner of Liverpool in advance (Manchester United came 17th in Division 1 after rigging their last game (2-0) against Liverpool to finish above Chelsea). To this day, it is impossible to explain what actually went on at that AGM. The arguments for Arsenal's promotion were complete nonsense. The committee took their vote, and Arsenal received 18 votes out of a possible 41, while Tottenham only received 8. Additionally, for many years there were rumours of significant amounts of money changing hands, but to this day, nothing has ever been proven. Hence, Arsenal were promoted from 5th place in the Second Division while neither 4th, or 3rd had a realistic chance in the vote, and Tottenham were relegated...... This moment started a feud between the two clubs that has continued on ever since! 1925 Herbert Chapman becomes Arsenal Manager for 2,000 p.a. Arsenal advertised their manager's job in "The Athletic News" on 11th May 1925. Herbert Chapman however had already been approached for the job. Henry Norris (by now) the Arsenal Chairman offered him £2,000 a year to take the job, easily the highest salary in the game, and Chapman needed little persuading! Some of Herberts inovations included Changing "Gillespie Road" underground train station to "Arsenal". This was an amazing coup at the time, because it resulted in millions of tickets, maps and signage being changed and was actually a huge operation. To this day, Arsenal are the ONLY Football team to have a station named after them. Herbert also advocated flood-lighting, artificial pitches and instigated placing numbers on players backs. On 23rd April 1927, Arsenal met Cardiff City in the F.A. Cup Final at Wembley's Empire Stadium. The team was: Lewis, Parker, Kennedy, Baker, Butler, John, Hulme, Buchan, Brain, Blyth, Hoar. Unfortunately, the visit was not a happy one, as Arsenal were defeated 1-0 with Hugh Ferguson scoring the all important goal for Cardiff. The day goes down in Football history for being the only time that the F.A. Cup has left England. Saturday 26th April 1930. After 44 years, Arsenal finally achieved their first success. It was the day that Arsenal wrote themselves into the record books. The 55th F.A. Cup Final saw Arsenal defeat Huddersfield Town (the dominant team of the late 20's) 2-0 infront of a crowd of 92,488 with goals from Alex James in the 17th minute and Jack Lambert in the 83rd minute. The team was: Preedy, Parker, Hapgood, Baker, Seddon, John, Hulme, Jack, Lambert, James, Bastin. 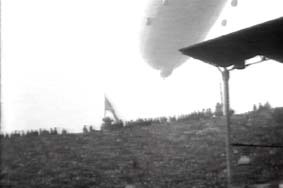 The game will also be remembered for the vivid image of the airship Graf Zeppelin flying 2,000 feet above Wembley during the first half, and King George handing over the trophy. 1930-31 was a massive success for the Gunners from start to finish. Arsenal established a record points total at the time with 66 points, while they scored an remarkable 127 goals. They also beat Grimsby Town 9-1 at Highbury (this result still stands as their biggest ever in the First Division). They only lost four games, and had an identical home and away record of 14 wins, 5 draws and 2 defeats. Jack Lambert also set up an Arsenal record of 38 League goals in a season. 1932 Arsenal just miss out on League and Cup Double.. In the F.A. Cup Final, Arsenal were equally unlucky being defeated 2-1 by Newcastle with Bob John scoring Arsenal's only goal. The Arsenal team for the final comprised of: Moss, Parker, Hapgood, Jones, Roberts, Male, Hulme, Jack, Lambert, Bastin and John. The West Stand cost £45,000 and was officially opened by the Prince of Wales (later the Duke of Windsor) on the 10th December 1932. It was actually first used on the 12th November for a game against Chelsea (Arsenal won 1-0) and was, by a large margin, the grandest and most expensive structure on any league ground at the time. It incorporated three flats, an electronic lift, and had 4,100 seats and the lower lever, which was originally all standing, could in theory hold another 20,000. While the West Stand was being built, a story that has become a bit of folk-lore at Highbury occurred. Local inhabitants were encouraged to bring along their rubbish to help in the process of raising up the banking on all four sides of the ground. One coal merchant backed up too close to the hole in the North Bank and saw his hourse and cart disappear into the cavity. The animal was so badly injured that it had to be destroyed and it is buried where it fell, in the middle of the North Bank terracing. Herbert Chapman decides before the Liverpool game at Highbury to add white sleeves to our red shirts to add distinction. 1933 / 4 / 5 Arsenal win THREE First Division Championships in consecutive years!! Arsenal were awarded a crest by the Football League for this achievement that still hangs outside the directors offices in Highbury's East Stand to this day. 1934 / 5 Ted Drake breaks Arsenal scoring record. Ted Drake scored 42 League goals. He scored 4 goals against Birmingham, Chelsea (and in the next game) Wolverhampton and Middlesborough. His mere hat-tricks came against Liverpool, Tottenham (suffer hehehe) and Leicester City. He also scored 1 goal in the F.A. Cup. against Brighton and Hove Albion and 1 goal against Manchester City in a 4-0 Charity Shield victory, bringing his seasons total to 44 goals. 1935 Highbury Record Attendance set. On the 9th March 1935 Arsenal welcomed visitors Sunderland to Highbury. Unfortuanately the 73,295 RECORD ATTENDANCE were only thrilled with the cramped conditions as the final score was 0-0. 1935 Ted Drake scores 7!!! On December 14th 1935 Ted Drake Scored all SEVEN goals in Arsenal's 7-1 victory against Aston Villa at Villa Park in Birminham. The record still stands to this day as the greatest number of goals scored in a Football League First Division (Premier League) game by an individual. For the first quarter hour Villa were the better team, but at half-time they went in 3-0 down and Drake had a hat-trick. All the goals were classic Arsenal - a long ball from Pat Beasley for Drake to run on to, a long pass from Bastin which Drake picked up and ran with to the edge of the area before scoring, and a rebound from a Pat Beasley shot from the wing. At the end of an hour Drake had a double hat-trick and Arsenal were 6-0 up. This time the goals came from a mistake from Villa centre half Tommy Griffiths, who assumed a ball was going over the dead ball line only to see it rebound off the post for Drake, another pass from Bastin to Drake and an instant return from a bad goalkeeping clearance. Drake was controlling the ball perfectly, beating defenders at will and shooting so accurately that the Villa Keeper, Merson, had no chance. It was the exhibition of a complete centre forward. By this time the entire Villa half back line was marking Drake, but it made little difference for his seventh shot actually hit the bar and bounced down to be cleared. It was one of only two goal attempts of the whole afternoon which missed it's mark (the other was saved). Villa did score once, but Drake had the final word in the last minute with yet another goal from a bastin cross-field pass; seven goals away from home with just nine shots. Saturday 25th April 1936. Arsenal defeated Sheffield United 1-0 at Wembley with a goal from Ted Drake in the 74th minute from a Cliff Bastin clearance. Drake was unable to get off the floor after scoring the goal due to pain from an injured knee. When he finally got up, he remained on the field without actually taking part in the remainder of the game. The team for the final was: Wilson, Male, Hapgood, Crayston, Roberts, Copping, Hulme, Bowden, Drake, James and Bastin. Incidentally, Arsenal had previously been fined £250 by the Football League for resting players (Roberts and Drake) and fielding less than their most competative team between F.A. Cup ties (once Arsenal found that they were unable to win the First Division for the 4th consecutive time). Arsenal opened their new East Stand for the game against Grimsby on 24th October 1936 (scintilating 0-0 draw). The main stand, though planned to be identical to the West Stand, finally cost far more (£130,000). One reason for this was because it had an expensive public frontage - the West Stand is built almost entirely behind a row of houses and is effectively invisible from that side. Once again, Ted Drake was the highest scorer with 17 goals dispite missing 15 league games through injury, while Cliff Bastin contributed 15 goals. This Championship signalled the end of a quite remarkable era when Arsenal became the most recognised football team in the world!! The last game at Highbury before the Second World War was against Brentford on the 6th May 1939 and Arsenal won 2-0 with goals from Alf Kirchen and Ted Drake, but it was MORE noteable for the fact that it was used to make the film "The Arsenal Stadium Mystery". The story centres around a footballer who dies by poisoning during a game at Highbury. Scotland Yard investigate, and all the Arsenal and "Trojan" players come under suspicion. 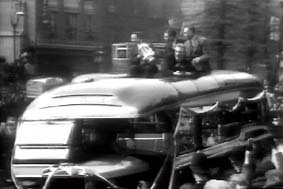 The film provides some wonderful footage of the great pre-war Arsenal team, both on and off the pitch. See the ground, dressing rooms and other fascinating "behind-the-scenes" views of the East Stand. Brentford in unusual change strip, played the fictional part of "The Trojans" and several Arsenal personalities took part in the film, including Cliff Bastin, Tom Whittaker and George Allison. 1939 World War 2 brings League Football to a standstill! With the close of the 1938-9 season, Arsenal were in the midst of a huge financial crisis. The re-building of the ground in the mid 30's had resulted in a huge debt burden with crippling interest payments. Crowds of 40,000 were required simply to break even. By August 1939, Arsenal had only £3 and 92 pence (metricised) in the bank. Luckily, the post war football boom between 1945 and 1952 when attendances soared, happily solved the clubs financial problems. The War was to prove a tragic time for a heavily bombed Highbury. No less than 9 of the 42 professionals on the books in 1939 failed to survive it, the highest loss of any club. The nine players to lose their lives were, Henry Cook, Bobby Daniel, William Dean, Hugh Glass, Leslie Lack, William Parr, Sidney Pugh, Herbie Roberts and Cyril Tooze.